Water managers and leaders in the Sacramento Valley are fully committed to advancing solutions to help ensure that all Californians have access to safe and accessible drinking water. The lack of safe drinking water in some communities across the state has been the subject of deserved attention in recent years. To date, this problem has been addressed through a variety of initiatives that include new policies and programs at the state level as well as targeted efforts and action by local entities and non-governmental organizations at the local level. The recently enacted Drinking Water for Schools Grant Program is one example of a new initiative that presents a meaningful opportunity to expand access to safe drinking water. The program is designed to help address impaired drinking water quality and access issues in schools serving disadvantaged communities. The application deadline for the grant program is March 1, 2019. The program makes funding available for projects to address impaired drinking water quality, such as treatment devices to address violations of drinking water standards with the potential to negatively impact human health. Funding is also available for projects that address impaired access to drinking water, such as replacing old, rusty, unappealing, broken or non-ADA compliant fountains, and installing fountains if one is not available in a cafeteria or main eating area. $9.5 million has been made available for the program’s initial round of grants and the 2018-19 state budget includes an additional $6.8 million for the program. Eligible entities include K-12 schools, and preschools and child day care facilities located on public school property. All projects must be located in, or serve, disadvantaged communities (DACs), defined as a community where annual median household income is less than 80 percent of statewide annual median household. A list of DAC school districts is available here (individual schools in non-DAC districts may also be eligible). Costs directly related to planning, design, and construction of eligible projects are eligible can be reimbursed in full under the program. The minimum grant amount is $25,000. The maximum grant amount is $100,000 for a single school and $1 million for a school district. Funding for technical assistance provided by the Rural Community Assistance Corporation is also available for purposes including, but not limited to completing applications, procurement of services, and overseeing projects. 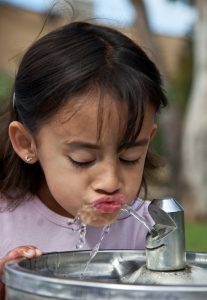 The Application Deadline for the Drinking Water for Schools Grant Program is March 1, 2019! More information is available from the SWRCB program page and the Rural Communities Assistance Corporation’s grant program page. NCWA members and others with questions or ideas regarding the program are also encouraged to contact Adam W. Robin, NCWA Legislative Affairs Director, at arobin@norcalwater.org or (916) 442-8333. Water managers and leaders in the Sacramento Valley are fully committed to advancing solutions to help ensure that all Californians have access to safe drinking water. A comprehensive approach that empowers effective local agencies, targets funding to address specific needs, and emphasizes collaborative locally-appropriate solutions, will enable continued progress toward ensuring that all Californians have access to safe drinking water.